Nutritionist Michelle Lake would like to get to know you. How you feel. What you do. How you live. What you eat, and when. Before your consultation, you will need to complete a questionnaire providing information about your health, lifestyle and diet. Michelle will use this information to build up a detailed, holistic picture of you. Please ask Michelle if you would like to be sent the questionnaire for children. You can download the form for adults below. Download the questionnaire to your computer, where you will be able to open it and fill in the answers. You can save your changes as you go along and they won’t be lost (remember to open the form from your computer). If you open the form in your browser, you may not be able to fill it in. At your consultation, you will discuss the questionnaire and agree on a nutritional and lifestyle strategy to address any concerns. Michelle will provide you with a written programme, including shopping lists, recipes and meal ideas to help you succeed. This will take into account your lifestyle, income and cooking abilities. In some cases, you may be recommended biochemical tests to help identity the best strategy: these will not be included in the price of the consultation. If tests are needed, the results will be analysed and discussed with you in a second consultation. Michelle may suggest nutritional supplements to support your programme (these can be purchased at trade prices). Follow up At your first appointment, Michelle will discuss how many times she predicts she will need to see you. On average, a client needs three consultations over a three to six month period to achieve the best results from a nutritional programme. Charges An initial 75minute consultation costs £75. Follow-up sessions last 30-45 minutes and cost £50. Where are we based? 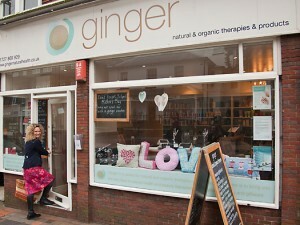 Michelle Lake sees clients at Sandridgebury House, Sandridge or Ginger Natural Health on London Road, St Albans. Appointments are available most weekdays and occasional Saturdays mornings. See our FAQs for more information. Please contact us for bookings.